The Micro FT™ is a patented reciprocating refractive scan interferometer. It can be used for a very compact, high throughput spectrometer. The current design is optimized for maximum throughput for commercially available high sensitivity Thermal IR detectors. It is also the heart of our Model 102 portable spectrometer, and was used previously in its predecessor, the Model 101. In addition to being very compact, the Micro FT™ is rugged, low power, totally sealed from the environment, and largely unaffected by vibration. For highly calibrated measurements, it can easily be temperature controlled using a thermoelectric cooler, as shown in the picture at the right. The temperature control device is attached to the base of the optical head. 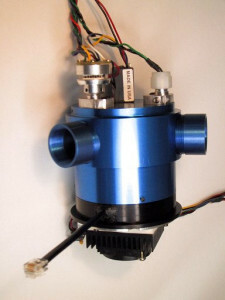 The laser diode, laser diode power supply, and laser detector are shown mounted on the top of the optical head. The Micro FT™ is the heart of our Model 102 remote sensing spectrometer. 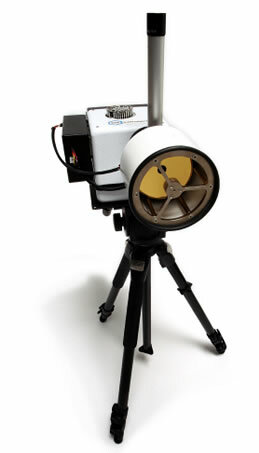 This instrument has been used worldwide in the field by geologists, and others, who are concerned with in situ measurement of calibrated radiance and emission spectra of terrestrial samples. The Micro FT™ has a unique laser sampling channel, which is needed in a reciprocating interferometer. It uses a temperature controlled laser diode, which is smaller and consumes far less power than the HeNe laser tube used in conventional interferometers. The optical assembly has been miniaturized, as shown at the left, to fit on the top of the optical head. The temperature controller, also shown at the left, is a small board, and is designed to be very efficient. Consequently, it consumes very little power once its steady state set point temperature is reached. In addition to geologic and mineralogical uses, other applications include remote sensing of pollution sources, and ground truth measurements for airborne and space sensors. The ruggedness, vibration insensitivity, and long term stability are all important qualities in these applications. We would be happy to discuss new applications, and recommend either the Micro FT™ or Turbo FT™ for them.